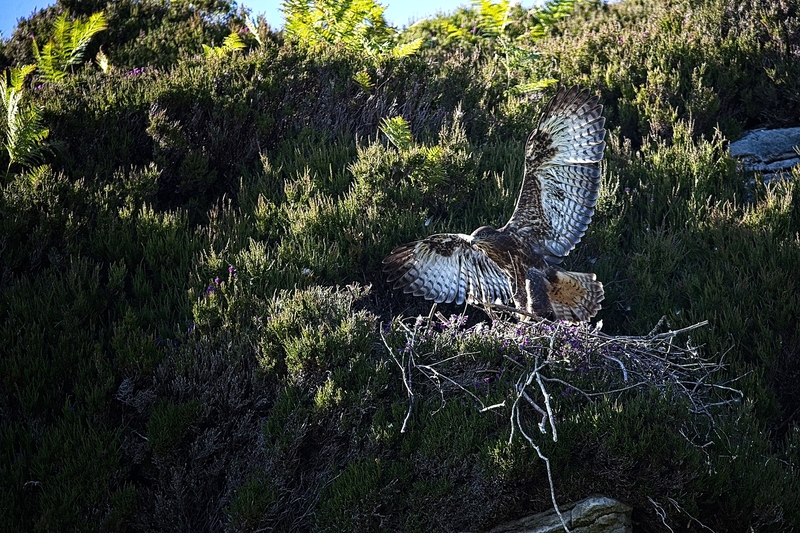 Female buzzard stretches out its wings whilst watching over her offspring which remains hidden at the back of the nest. 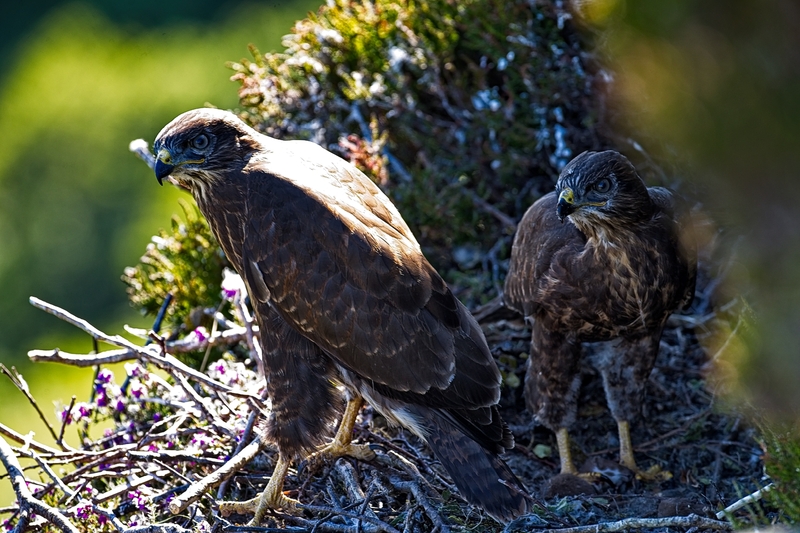 A chance encounter with a pair of buzzards and their juvenile, which was literally a few days from leaving the nest. I returned the following week and the youngster had fledged. 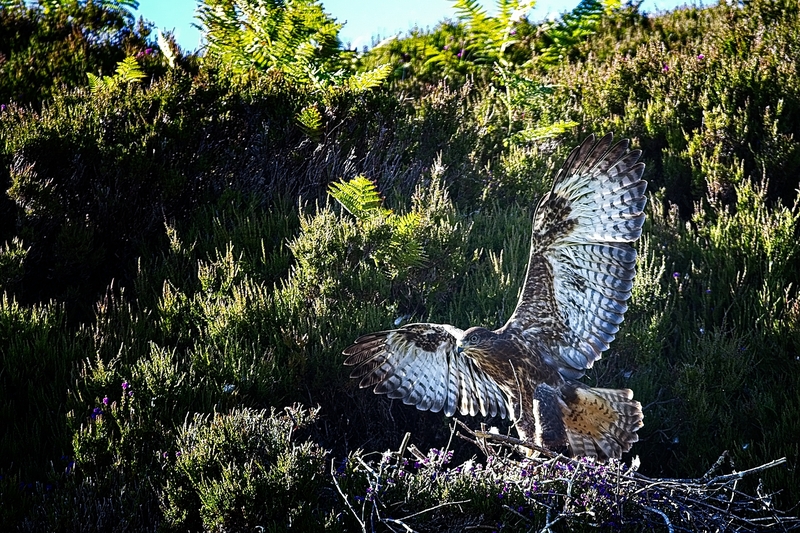 I only discovered the nest due to following the male with a mouse in its talon returning to the waiting mother and juvenile. At this stage both male and female share the hunting. When the two adults were together the size differential showed that the smaller male was on feeding duties. I am the first to admit that I cannot usually tell the difference between male and female buzzards when I see them hunting alone. I was able to get close to the nest and takes some images with the mother remaining fully confident that the nest was not under threat. As with many animals and birds, the female was aware that there were natural obstacles between the potential threat (of me with camera) and themselves. In this case all the images were either taken below the nest or from one of two rocky ledges at the same height as the nest but not conencted to the ledge where the nest was built. The mother could clearly tell that I was not capable of leaping from one ledge to the other! A slightly wider view to give the context of the nest location. 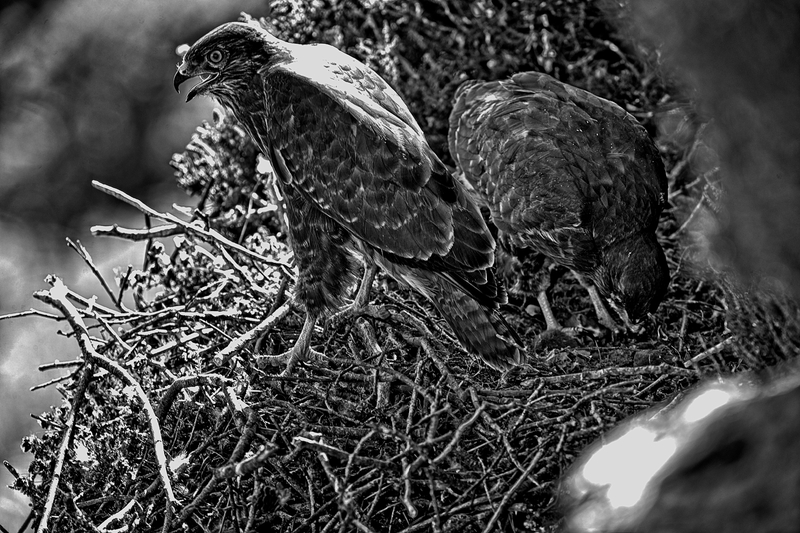 Buzzards make use of more than one nest and it is unlikely that this pair will use the same nest next year. The ground above the nest had a slight overhang so the nest was not visible from above. Below the nest you can see a small rocky outcrop. There were other outcrops each side of nest which I was able to scramble up to and gain a vantage point from which to observe the nest. Meal time. The youngster is tucking in to a meal of mouse which had been earlier delivered by the male parent. With the mouse still firmly under its right talon, the youngster stands alongside its mother in the nest. 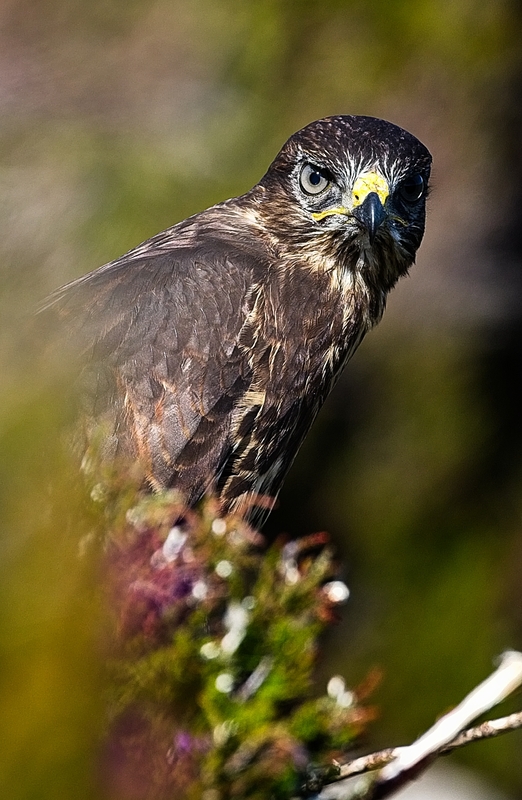 A few days after this image was made the youngster had fledged. A portrait of a proud mum. I was really pleased to create this image of the mother looking directly in to my lens. 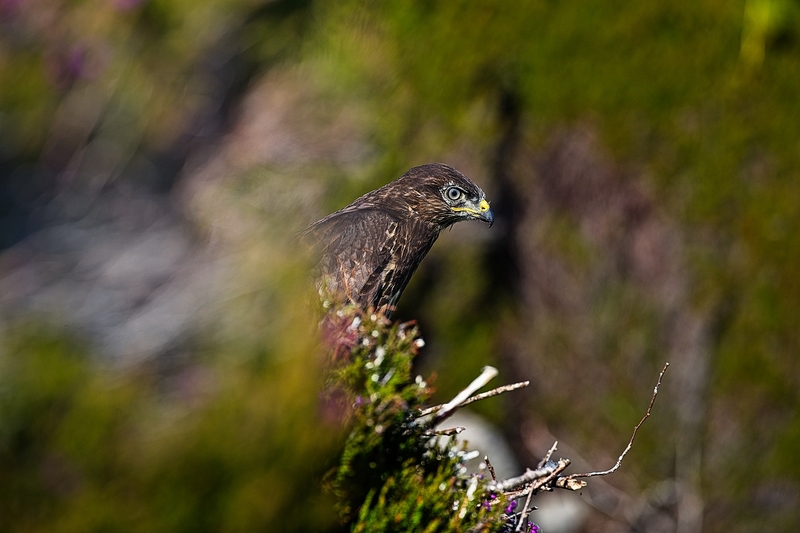 The heather surrounding the nest makes for a great backdrop with the female buzzard looking at its majestic best. A very special moment for the photographer who was desperate keep his balance on a narrow outcrop.